We are deep into our winter season here at home with freezing cold for over a week now. Along with that cold is rain, sleet, and wind. Despite the rain, the air is dry at this time of year. That means chapped lips! Chapped lips can look uncomfortable and feel even worse. The skin on the lips dry out and and start to split, leaving an uneven surface of flaky skin. The most common causes for this type of dry skin is exposure to wind, excessive licking of the lips and dehydration. It might be natural for you to lick your lips because you think the saliva will help but this actually exacerbates the problem and makes the lips even drier. Each time you attempt to alleviate the problem, you are removing the natural barrier that is trying to build up on your lips. Here are four simple solutions that you could try to help improve your chapped lips. Buy a lip balm and use this to help combat the problem. Be sure that the lip balm you choose contains beeswax, paraffin or petroleum. These will act as a barrier and keep the moisture in your lips. 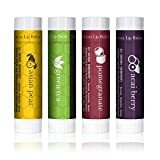 Lip balms or salves are available in tube form or in little jars and containers. Choose the product that best suits your needs. The weather can really dry out the lips if it is windy. Wearing a scarf provides you with a barrier so that moisture is not taken away. If it is a really sunny day, you will be wearing sun screan but you also want to ensure that your lips are protected. Choose a lip balm that contains sun screen. Most products on the market include this as a basic ingredient but make sure you check the label. Chapped lips can leave flaky dry skin on the surface. These are dead skin cells and it can look unpleasant. One way to get rid of this is to use a small brush (and old soft tooth brush can work) and gently brush the skin away. You have to be sure that the skin is completely dry and ready to flake off, otherwise you are going to open up the lower layer and exposure more raw skin than you would like. This will take longer to heal and could even cause a little pain as it is now a little open wound. After brushing away the dead skin layer, use a soothing lip balm to lock in the moisture. Dehydration can cause your lips to dry out. If you can, drink about 6-8 glasses of water per day. This is great for the whole body and your lips will thank you for it. I have a hard time drinking water. It can’t be cold and if it’s plain, I may not drink it much. So, using a fruit infuser is a great solution for me. It provides flavor without too much sugar or chemicals like with flavored water drinks. Shop Savvy Infusion at the Amazon Dining & Entertaining store. Free Shipping on eligible items. Everyday low prices, save up to 50%. These are some simple solutions to fixing chapped lips. If the problem seems to be getting worse or you are in real pain, you should seek medical advice and make an appointment with your doctor.